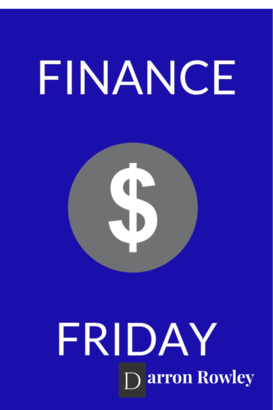 Thank you for taking the time to read another edition of Finance Friday. I hope this week has been an excellent one for you! I am excited about this edition of Finance Friday. I am going to share a few insights from this past week that I believe you will find valuable. This Tweet stood out to me for TWO REASONS. First, it made me realize how lucky we are to live in the country we do. I don’t know if his statistic of 10% is exact or not, but I do know the general idea is correct. There are many places in the world that live on less than $1,000 per year. This made me realize how grateful we should all be. There is always someone who has it much harder than we do. 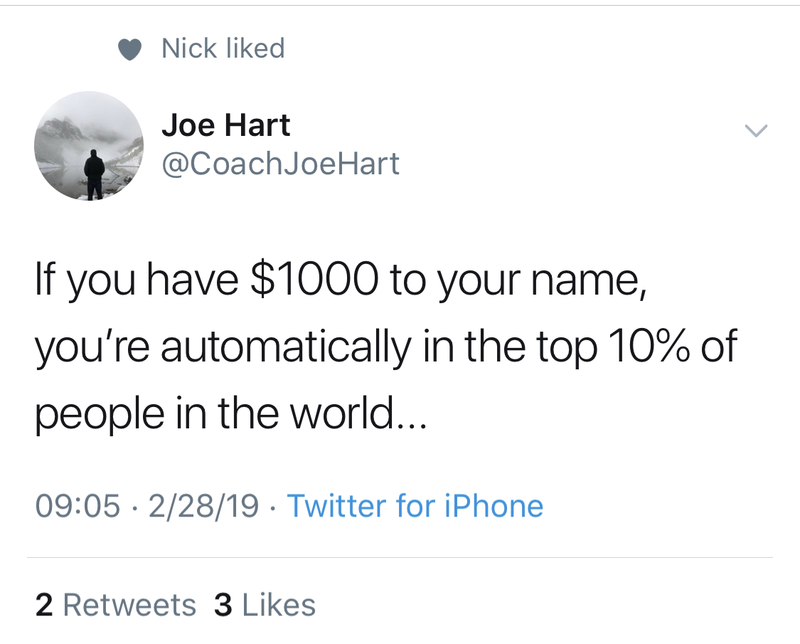 Second, it made me realize that with all of the opportunities we have in this country, if you don’t have $1,000 your name, there really isn’t a good excuse for it. As hard as that may be to hear, I believe it is the truth. It is a good reminder that we are in control of our lives, and if we want to be better with our finances, it starts with making the conscious decision to change. If you want to be somewhere different than you are right now, you won’t get there by doing the same things you are currently doing. I say re-learned because they were not new lessons to me, rather lessons I already understood but needed to be reminded of. 1- First lesson – Invest in Yourself! Over the last 7-8 months I have been working on my blog. The readership is growing but not as quickly as I would like. This past week I came across a blog that talked about the value of SEO (search engine optimization). How you use SEO is essentially how Google decides if the content on your blog is valuable. This then determines if anyone is going to organically see what you write. While I feel that the content I have posted over the last few months is valuable, I hadn’t done it according to Google’s standards. What did I do when I realized this? I went and paid for an expensive course (in my standards at least) to teach me how to benefit from SEO. I realized that I can pay the money to learn how to do it effectively with good SEO, or I can still produce good content with poor SEO and have no one ever see it. I paid for the course and am already seeing progress. This is something I should have done sooner. I wonder how often we refuse to spend the money to improve ourselves, and later find out we haven’t progressed at all. Time is valuable! If you can save the time by paying an expert to help you, it usually makes sense to do so. Not only that, you are more likely to act on something you have paid for – opposed to having no accountability if you decide to learn it on your own. There is power with having skin in the game when you pay for something. This will change the way I personally do things moving forward. Great lesson to be reminded of. I would encourage you to look into your life and decide what areas you need to invest money into so you can start moving forward today – and not a year from now, but today. I have been working with a friend of my to find more ways to get my personal finance content out to more people. This past week we were meeting with a business owner to see if we could rent a spot at their business for our personal finance trainings. In the course of this conversation, the business owner we were talking to asked us if we know of any investors that may be interested in investing into her business. As we talked further, I realized her business aligns closely with one aspect of Finance Mindset. I don’t know if that investment will actually happen, but I do believe this new relationship will be mutually beneficial to both of us. This helped me realize the importance of being active and getting to know as many people as possible. You never know who you will come across, and how it will impact you. In a previous post I talked about the power of compounding. Each new relationship you create, opens up hundreds of potential new contacts – in essence your sphere compounds the more people you meet. You never know if that next person is the one who can help you reach your goals. I realized I need to be more active in getting to know others. Each time I do it I realize how much value it adds to my life. I was listening to a podcast on Thursday morning where two guest were debating the emotions of money. One of the guests was an engineer. He said that he believes money has nothing to do with emotion. It is all about the math. As I thought about this, I believe there is truth to what they are both saying. For some people, understanding the math may be enough to change habits. For most of us though, I believe we are very emotional in the way we act and spend our money. The tip for this week is to examine which personality you fit into – you may even find that it is neither or a combination of both. What matters most is understanding what works for you. Money is very personal – one size does not fit all. I challenge you to explore your money actions to see what it is that drives you so you can better understand how to control and conquer your finances. Thank you for reading. I hope this adds value to your life in some small way.